I’m a mom of two special needs kids. I make all of my kids’ foods from scratch to avoid their combined 35 food allergies and sensitivities. I also manage multiple specialists, food supplements, medications and education IEP’s. Take time to write down a master checklist for your day. Place the checklist in a plastic protector to be reused. Managing special food diets, supplements, medicines and therapy appointments is overwhelming! A checklist frees your mind to take care of your family knowing you are not going to forget the details. Designate a box for completed school papers. Your school papers box will do double duty. Kids with learning disabilities sometimes need to revisit old worksheets to remember how they learned a school skill. These papers will also help give you concrete examples of what skills your child still needs help with to take when you go to their IEP meeting. Keep all your supplements and medicines in one location. Our kitchen has often looked like a small pharmacy and health food store! Go ahead, I give you permission, devote one whole shelf or cabinet to your child’s needs. And don’t get rid of those old baby food carousels; they are perfect to hold pill bottles. Children with special needs qualify for additional tax benefits. Keep all your receipts from supplements, doctor’s visits, special schools, foods bought for food allergies and the mileage for each of those events. Just like the school papers, just keep them in a box so you have them if you need them at tax time. I put all our chiropractor and NAET appointments in green on my calendar. They are easy to find when I am planning my week so I don’t miss any appointments. It also makes it easier to go back and make a mileage list for taxes. I have at least 20 plastic medicine spoons. I keep them in the kid’s bathroom and the kitchen. What items do you always run out of? Parenting special needs kids is stressful. Anything you can streamline or duplicate may make your day run more smoothly. Keep a small notebook to record daily events. Special needs children can be affected by foods and medical changes. I found that jotting down what my kids ate, when we changed supplements or medicine dosages and unusual behaviors overtime helped us make better decisions in managing our children’s needs. Lisa is a Cincinnati mom who has struggled the last 10 years to give her kids the best education, food and treatments money can buy. Raising special needs kids is taxing emotionally, relationally, financially and physically. Her dream is to break down the walls isolating special needs families and providing them with information to help them achieve their goals. Lisa blogs at . Time Management 101: Stop Trying to "Do It All"
Q&A Tuesday: How can I be organized when I have a nursing baby and toddler? Free Customizable Daily Docket now available for download! Managing Your Time When It's "Just You"
Looking for more? Read more posts about Time Management. 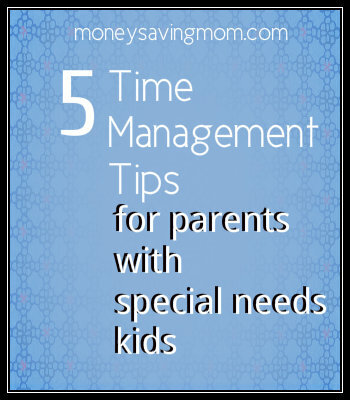 Thanks for posting a time managment piece for Moms with special needs children! Warrior Mama, I will definatly be visiting your site! Kudos to you. These are great suggestions! My brother had cerebral palsy, and your tips brought back a lot of memories. I commend you for all the hard work and care you take. You can be sure it is appreciated. What great Ideas! My daughter has cerebral palsy, and tracking our mileage to and from her neurologist has been frustrating, because I just can’t remember all the times that we’ve been for the entire year. I love this, oh, and you ARE a warrior mama! I’ve never thought to track mileage for tax purposes. We go to therapy every week for my daughter with CP. Do you know if that is an expense I could submit? If so, I am ON IT! YES! milage for all therapys and doctors appoiments are medical expenses. @Lisa, Yeah, you can either track mileage or record gas expenses. For me, it’s easier to track the mileage because it’s the same every time. This is a great piece! Thanks so much for posting it! I have a 4 year old son with Down Syndrome, so I really love this article! I totally agree with the get extra medicine spoons, but you dont have to buy them, I always ask for extras at the Walgreens Pharmacy…they are always willing to give you a bunch for free! Yes, thanks for the reminder – they were free! I am going to be sharing ideas about how I organize and “declutter” on my blog, BUT I actually find having a multitude of items you use every day (like medicine spoons) is very helpful! You have no idea how much of an answer to prayers that this post is today. My son was just diagnosed with Asperger’s, Tourette’s, and Co-morbid ADHD. I feel very overwhelmed. However, one of my new year’s goals is the be intentional, and I have already started implementing several of these points listed here. It’s good to see that I’m on the right track, too! @Jennifer, Oh Jennifer, I remember being where you are! #1 Your child today is the same child that you had yesterday. The label of autism dosen’t change that. #2 It is OK to to be upset. It took me a long time to realize how angry and mad I was. It’s hard not to project into the future after recieving the dx of autism. BUT there is hope! Take care of you. And then get ready to be a Warrior MAMA! Thanks much for this post! At this point, our family of teenagers runs fairly smoothly (compared…) but when my kids were small, with three unique special needs, our life was complete chaos. I was unable to finish anything because of behavioral issues–I was always handling some kind of screaming fit or disaster. This was before blogs and internet!!! Support was nonexistent. Most days were just a question of survival, and that’s putting it mildly. Please keep breaking it down and sharing your experiences! I bet you can feel the overwhelming emotions grip you even as you think back to those chaotic days! Thanks for the hope of a calmer future! Love, love, love this post! We’re just in the process of figuring out what my son’s health issues and treatments really entail, and I feel so overwhelmed by it all. Between multiple doctor and therapy appointments a week, along with balancing his special diet, I’ve been struggling organizationally. Thanks for the tips, so very helpful! It is amazing in hind sight how accurate my mommy gut was on which medications to try, what foods to eliminate, what schedules to try and what diagnosis fit my kids best. You really are the expert. Use the “experts” to help you in your plan. Very helpful tips! I’ve also found that I’ve had to let go of my ‘ideals’ and hire a mother’s helper a few hours a week. We keep a big desk calendar on the wall of our kitchen to note changes when we start supplements, etc. Calendars are such awesome tools, aren’t they? I found my kids baby book calendars extreemly helpful when we were getting their needs identified! And YES – get help! Guilt free help! It is amazing what we as moms think we should “handle” on our own! I think the hardest thing I had to do, (and am still doing) was to let go of “ideals”. It is so hard for me to do things that meet my kids needs but are not “age appropriate”. I grew up with a severely handicapped sister. She’s 3 1/2 years younger than me, and is deaf, blind and profoundly mentally retarded. Wow. I feel that the parents of special needs children are so busy trying to make ends meet and take care of their kids that “we” don’t see how drastically the parents lives are impacted. Great ideas. I am a teacher of students with special needs. My parents are always struggling with these issues. I will be giving them this link, thank you. Also keep up the hard work. I have seen kids who weren’t “suppose” to do things accomplish great things. Most of them it was because people cared and worked to help the child soar! Isn’t it amazing how resilient humans are? Unfortunately I see the rising numbers of special needs students as staggering. I wonder how this will effect our military and government in the next generation. I’ve had a lot of practice. 🙂 I am a teacher too! So may be that is why I can break it down and organize what I do and how. It’s always good to hear though. Thank you for this post. I am constantly overwhelmed trying to be a good mom to my two boys, all the while managing the multiple needs of my daughter. The therapist, doctor, and specialist appts can be overwhelming and frustrating. So often I see an organizational post and think that it wouldn’t work for our family. Thanks you for this…great ideas and love that it’s written by somebody who understands what’s like to be in this position. Thanks so much for sharing this post. I, too, will be adding this mama’s blog to my google reader! I bet Google calendar is a life saver for you! I am such and old school paper pencil gal. I still use a planner. But I couldn’t live without my Blackberry! As a special needs mom I can’t tell you how many times we tried the wrong thing before finding the right one. We have a great support group here in this area, and I would have been lost without it. I always like hearing what others are doing because you never know what is going to work for your child or not. Having a schedule for my 7 year old autistic son was THE BEST thing I could have done for him. He is a visual person and thrives on routines (of course) so I printed out a checklist with visual graphics and words, then laminated it. At first he needed the checklist, now he has it memorized and we have very little fighting to get out of pj’s in the morning. My daughter loves checklists too. I think it because it takes “us” out of the equation. They just pick up the checklist and complete it. Thanks for this post! I have a special little guy who is special needs as well. I work full time and also have a daughter. I never knew there were tax benefits…..ever…. I just sucked up the extra costs and lived with it. As a single mom, I just want to give them what they need at any cost – and any tax benefits would definitely help! Im going to look into this for sure! But he is not severly impaired, Autistic, does this make a difference? It does not matter what the diagnosis is. If it is a medical diagnosis – adhd, autism, bipolar, etc. and they have an IEP (school plan) then you have a deduction. Your total amount spent on all medical needs to exceed 7% of your gross salary. We spend about 20 – 40% of our salary on medical needs. I will definately be blogging about this soon. @Lisa, I believe the correct percentage is 7.5 percent. I was hoping to see a post about this! Great tips! I do most of them but never knew all the money and time I was spending on our special needs children was tax deductible! Hmm..maybe next year. Glad to give you the idea! Keep a calendar of all your appointments. It is a HUGE help! I’m glad you liked it! What else would you liek organizational tips for? Another thing, not sure if this is just in my home, but having two children with Autism, I have a sinking fund for things that routinely get broken. If an appliance has a warranty, I get it. And I really make out. As they get older, they get bigger and stronger, and even happy stimming has caused dishwasher doors to break, cabinets, doors and walls to need more than DIY repairs, refrigerators to rarely last more than a year or two, while full blown foot stomping in the shower has caused major damage. Wow I hadn’t thought of those things. I guess I should start a sinking fund too! In order to claim the deductions, you must itemize and use 1040 Schedule A.
Wow. It was wonderful to read this. My oldest son, now 12 has cerebral palsy. I had no idea about the tax deduction. We are in that weird position where we make too much to qualify for anything (he is on the waiting list for medicare waiver-for like 10 years now); yet we can not afford all of the therapies etc. And insurance does not pay for these things since they say it is a chronic condition. Money has definitely been the biggest hurdle. I stock pile too! I can NOT shop with my kids!! And add that you need support. Your children’s victories will be their victories. You will grieve the milestones not achieved but you will rejoice with the ones achieved. Don’t allow yourself to become isolated and spend time on yourself too.